Earlier this month Nyko released its Portable Switch Docking Kit, a $50 alternative to Nintendo’s official $90 dock. Mine works great, and charging the Switch in tabletop mode is very handy, but a handful of users are reporting the device has killed their console’s charging port. The Switch dock Nyko has released is slightly different from the one announced earlier this year. Rather than a small square featuring only an AC in and HDMI out, the released version sports a trio of USB connections, so tabletop players can hook up external controllers. The device comes packaged with an HDMI cable and its own USB-C power adapter—everything needed to connect the Switch to a television and for big screen play. The port atop the unit can be swiveled from full upright to an angled view, perfect for tabletop play. The Switch is supported by a piece of plastic that slots into the underside of the dock for storage and travel. It takes a little pressure to set the Switch on the dock properly, but once situated everything functions as the Nintendo dock does. I’ve heard reports that the dock’s television output is dimmer than the official Nintendo dock, but I didn’t notice a significant difference when swapping between the two. 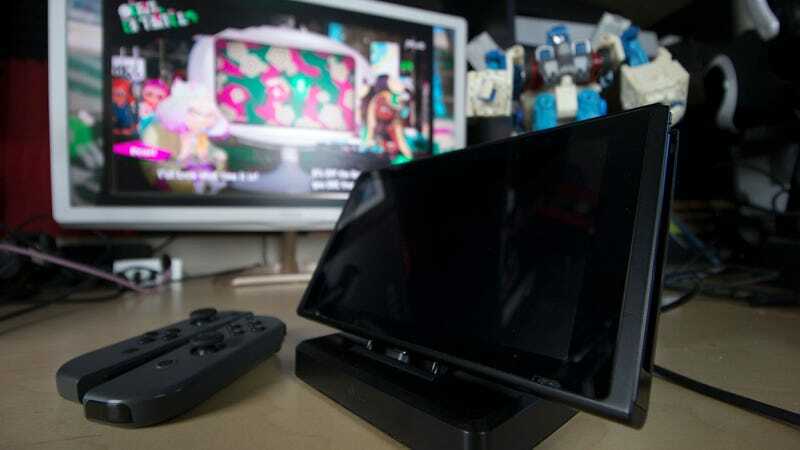 Based on my experience alone, the Nyko Portable Switch Docking Kit is a no-brainer of a purchase, but several visitors to the Switch Reddit have warned that the dock has busted the USB-C port on their consoles, rendering them unable to charge. Nyko took to the Switch Reddit yesterday for an AMA, where it addressed these reports. We always run our products through rigorous testing procedures. Any of our products that have electrical components also carry all required certifications like CE, UL, ROHS, etc., to ensure that they meet quality and safety standards. We are only aware of one instance that came through our customer support team. We are investigating it now and taking care of that customer. Nyko also stated that in the rare case that one of their accessories damage the console or system it is designed for, they will replace said console or system. I’ve seen plenty of users saying they’ve had no issues with the Nyko dock, and mine is working great. As someone who’s already spent $90 on a second official dock, I am kicking myself for not waiting. I like it, and hope it continues to leave my USB-C port unmolested.